Get ourselves ready and packed; and come down for breakfast at 7:30. Or, rather, we don’t – the sliding door is locked on the far side and is immoveable. We knock on it to no avail. We can appreciate that those staying at the hotel may be locked out of the bar so they don’t sneak down and help themselves in the night, but it is now after breakfast time. We prowl around looking for an alternative exit and study the fire safety diagram on the wall, which requires advanced interpretative skills to follow. There are no “run-out” signs, but there is an unmarked door beside the infamous sliding door. John remembers that there is a second unlabelled key with our room key. We try it in the lock and hey presto we are out on the street at the back of the hotel. We walk around the block to find the four resident workmen, fags in mouth, standing beside the locked front door. A van arrives to collect three of them for work and we ask the fourth about breakfast. He shrugs. Sheila returns via the back door, stamps about loudly and hammers on any door marked ‘Privé’, finally obtaining a response of ‘j’arrive’ from one. We re-assemble at the front door and eventually Madame arrives, first fag of the day in mouth, to unlock the front door. Sheila’s pointing out that we have a long journey to make and 8:00 am is not an acceptable time to serve a 7:30 am breakfast is met with a shrug. We decide to get the trike ready while we await breakfast and ask for the garage key. Apparently we cannot have it because it is too early for Madame to get the key from the owner of the garage. Sheila moves into “angry and authoritative”, summoning up an impressive new range of French vocabulary, and as if by magic the key appears and is handed over. Not a total disaster, but we will not be putting the Hôtel ******, Villefranche de Panat on our recommendation list. We have the distinct impression that we are both the only foreigners (by which I mean someone coming from more than 50km away) and the only tourists to have come to V de P this century, and may well be the last for a very long time, allowing the locals and Madame to settle back undisturbed into their bar and fags. On the road we discover that the only road out is via Besse, so having avoided it yesterday, we now have to start with a climb up to and through the town. Up on the tops we have some great long views of the countryside that was shrouded in mist yesterday, now in sunshine. We had been planning to take an unclassified road down the steep sides of the Tarn gorge to Le Truel, but fearing this might be more mountain track than road, we decide to take the longer way round using a small D road. Nonetheless it is an exciting hairpin bends plummet down the vast cliff sides of Tarn gorge. We stop a couple of times on the way to take in the stunning view and to take some photos. 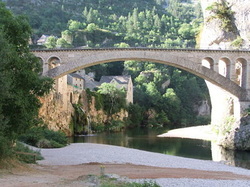 Through Le Truel and over the bridge to the south bank of the Tarn we climb again to a barrage. From here it is a serious climb out of the valley up the side of the gorge to the cliff top again. Sheila, who thought that once we were on the Tarn it was a flat run (like the Lot), is a bit moanie. A stop at the top on a balcony opposite St Victor for great views, and more importantly a PaR to supplement our meagre breakfast, soon cures this. Then it’s steep downhill time again back to the riverside in the bottom of the valley and a repeat up and down climb before we re-cross the Tarn at a barrage. From here on it really is riverside cycling and we can relax in a middle gear and enjoy the scenery as we pass St Rome de Tarn on the other bank. Our journey takes us on and under the Millau viaduct carrying the A75 motorway over our heads way up in the sky above. This is certainly an impressive, and almost slightly scary, piece of engineering well worth the two Michelin stars it has gained as a tourist attraction in its own right. We run into the large town of Millau itself and are unfortunate to run into some road works where the road has been newly tar sprayed with gravel chippings being thrown onto it. The trike tyres become coated with tar and chippings and look like a black version of a piece of fish coated in breadcrumbs. We grind into centre ville. While Sheila goes into a bar to seek cold water refills for our bottles, John settles to the task of scraping the tar and chipping coating from the tyres, not helped in the task by some drunken youths seeking to be a nuisance and indulge in pointless ATQs. Once sorted we head out of town. The run out of town to Aguessac, although on a yellow D road, is horrible. It is busy and in part a dual carriageway, but with one lane closed making it difficult for traffic to overtake. Things improve after Aguessac but it is still quite busy. After a while we realise that we have made a mistake, because although we have followed the route we intended, for some reason we got this wrong when originally route planning. We should have crossed the Tarn in Millau and used the unclassified small roads on the other bank through cherry orchards to Le Rozier where that road crosses again to the north bank. Too late to retrace now, so we continue the next 15km to le Rozier on a road which is not perfect but becoming less busy. Half way along we take a break in Rivières sur Tarn for a picnic lunch on a shady bench. This is opposite a café so Sheila goes across the road to get two ‘takeaway’ SdM&C to have with lunch. Once past Le Rozier we are in the gorges proper and the scenery ramps up from splendid to spectacular. The road remains gently undulating. We continue through les Vignes, beside Pas de Soucy, around the Cirque des Baumes and into les Detroits. At the les Detroits belvedere we pause to peer down at the river far below. On to La Malène, where we stop to contemplate a boat trip. 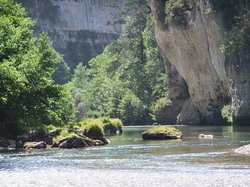 The trike is parked out of harms way down beside the canoe hire location and we share a traditional La Malène flat bottomed punt with a French couple for the 8km trip down to Les Baumes through the deepest and most narrow sections of the gorge. Return is by minibus. Back at La Malène we retrieve the trike and notice that there are six vintage Velox mopeds parked there. As we continue they overtake us and we overtake them in turn. They manage about 30kph, which is better than us uphill, but we can outrun them downhill. The riders are elderly gents with yellow tape measure braces and pudding basin helmets. Like us they have spare tyres lashed to the back of their machines. The whole entourage looks as though it should be taking part in a film. John decides that this is the machine he wants when he can no longer pedal a bicycle. A few not too severe ups and downs bring us to St Chély du Tarn. St Chély village is an attractive huddle of old buildings in an impressive setting on the river but off the road, nestling below the gorge cliffs in the middle of the Cirque de St Chély. We turn down the small lane to St Chély and drop down to cross the bridge into the village. Much of the village belongs to the Logis hotel or is now Gite de France, but it is well restored, peaceful and with no sign of obtrusive tourism. Picturesque is the word. We are in an annex building beside the small stream that ends into a fountain into the Tarn. After S&W we have a short walk to explore the village and riverside, before adjourning to the hotel restaurant for drinks followed by a relaxing dinner and early night. We had planned to spend part of today canoeing and John, who is up first, wanders down to the beach to check out the canoeing possibilities. There appears to be a half-day possibility from here to La Malène. At breakfast we ask the hotel staff about canoe hire. TP7 - the season does not start until next weekend, tomorrow. Unlike the Lot, there is no bus service along the Tarn, so alternatives involve various taxi and canoe combinations from St Énimie or Montbrun. Sheila is not keen and we agree that the effort and complication is just too much to make it worthwhile. Instead we decide to take a walk and follow the footpath for as far as we are inclined, threading along the gorge side in the direction of St Énimie. It is hot but there is plenty of shade in the trees and we stroll slowly enjoying the views. Eventually we reach the point where it is quicker to continue into St Énimie for lunch than to turn back, so we carry on. St Énimie is a complete contrast to St Chély. The riverside is a vast car park / canoe hire depot and the shops fronting the Tarn are full of tourist tat of the “kiss me quick” variety. This is quite unlike everything we have seen in the Tarn gorges hitherto. St Énimie would have been a better base for canoeing, but Sheila chose St Chély for our overnight stop because that was already a long way from Villefranche de Panat. A good decision as it turns out because St Chély is quite magical and St Énimie is very decidedly un-magical. Sandwich lunch in a bar, purchase of a large bottle of water and we set off back. On the way we come to a fork in the path. It is the sort you walk pass in the opposite direction not even noticing it is a junction, and, yes, on the way out we walked past it not even noticing it was a junction. We pause. It is a 50/50 decision. John thinks right, Sheila left. We go left. After a while John says, “do you remember this grass by the track?”.....and later, “do you remember these pine cones?”….and further on, “do you remember coming down so steeply as we are now climbing?”. Finally the noise of traffic is heard. We are climbing out of the gorge and onto the causse on the wrong track. TP8, turn around and return. Back at St Chély we complete our short, now longish, 11-mile walk. No problem, but unfortunately John’s knee and leg issues have returned and are giving him some pain. This has been lurking around for a couple of months. It doesn’t seem to interfere with cycling but is brought on by walking – real nuisance. Before returning to our room, John persuades Sheila to go down to the river so he can take a photo of her at the waters edge. When we get there John rolls up his trousers and wades in keeping sandals on because of the stones. Big telling off. Irresponsible treatment of an expensive pair of leather sandals. Sheila takes charge of them and supervises their drying and restitution for the rest of the afternoon. John feels like an admonished child and tries not to do anything else naughty. Back in our room we decide the best cure for John’s knee (and naughty behaviour) is a shower, chocolate, and the rest of the afternoon in or beside the hotel pool. Suitably relaxed we adjourn for aperitifs and dinner. We stay up tonight for the late evening show. Once it is fully dark there is classical music played from loudspeakers around St Chély; and the village, bridge, river and cliffs around the cirque are subtly floodlit. We wander down to the bridge with other residents for this son et lumière performance. Sheila decides, “It is very special and well worth a two-day stop”. John agrees.